WHAT IS THE DIFFERENCE BETWEEN EVENING AND BRIDAL MAKEUP? Evening is your chance to sparkle by adding more drama to your face and to that of your clients. Low flattering light allows you to keep on brighter colors without appearing overdone. Shimmering and frost-like shades appropriate for day wear looks subtle and beautiful by candle glow. At night, you can let your imagination run to more glamorous effects and looks. The definition of the eyes and the lips is of most importance in evening makeup. WHAT WILL WE COVER IN THIS CLASS? Green eye shadow and orange lipstick is NOT recommended for the evening. These colors look ruddy and may disappear in the artificial light. The makeup artist can line the eyes more dramatically. These are textbook rules, and moi, Sandy seldom believe in it, because my eyes are always dramatically made up for day time, but these guidelines are for the ‘new’ artist and for a non-artist. 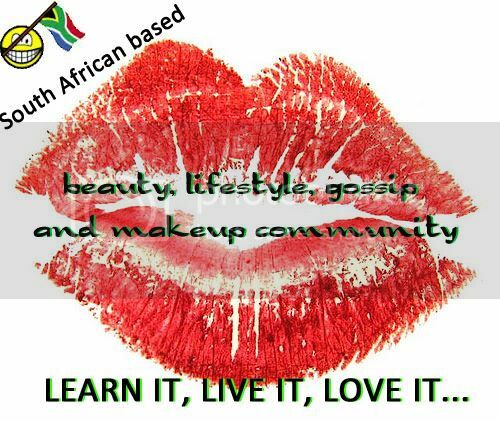 Some people may think they can apply makeup, but are in need of some textbook direction. Black, blues, violets can be used now with more drama to enhance those eyes at night. Apply the eyeshadow according to the shape of your clients eyes using more frosted shades and deeper colors. 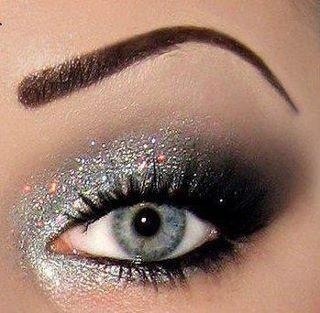 Add a sparkly kind of shadow onto the center of the eyelid in line with the pupil. Try silvers or pearly pinks for cooler seasons and gold or frosty peaches for the warmer seasons. Once you start getting really good with makeup applications, you’ll know how to apply any colors, regardless of which season it may be. Blend the gleaming eye shadow into the edges of the darker shade. Apply blusher as usual, with or without a corrective technique. Evening makeup, the artist may add extra glow onto the clients cheeks if desired. Don’t forget to work on the décolleté. Add blusher here and there if the client is wearing a low cut top, because this will bring everything from the face to the outfit together. Foundation can be lighter or darker that the normal skin tone and can be applied a little more heavily if required to create the flawless finish. Face powder should be used to highlight the face and doesn’t have to be used all over the face. Contour cosmetics can be used with more definition, particularly under the cheekbones to create an enhanced bone structure. Eyeshadow can be very bright and shimmers/glitters can be applied using several shades, blended together for a maximum effect. 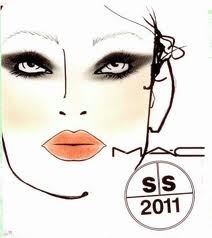 Use more eyeliner and kohl to the inner lines of the eye to compliment the eyeshadow. Color liners can be used too. You can also use colored mascaras, just remember that black mascara always wins, and its best to use colored mascara on the lower lashes only. False lashes may be applied!! Go for it! Remember that DUO eyelash glue is the best glue on the market for falsies. Go for those silver, gold frosted lipsticks. This may create a pouting effect or you can use a highlighter to paint a thin line above the cupids bow to emphasize the shape. When applying evening makeup, a clear white light should be used and bear in mind the effects that different lighting will have on the look of the makeup. There are 4 different types of lighting which affects makeup in different ways. WHITE LIGHT (NATURAL LIGHT) – Contains all the color of the rainbow. When white light falls on an object some colors are absorbed and others reflected. It’s the reflected colors that we see. If makeup is done in the daylight, use subtle colors as less is more during the day. FLUORESCENT LIGHT – Found in office spaces or schools. This contains excess of blue and green, which have a cooling effect on the makeup: the red in the face doesn’t show up and the face can look drained of color. Reds and yellows should be avoided, as these will not show up, blues will. Also don’t apply dark colors, the fluorescent light intensifies these. INCADESCENT LIGHT – Lights produces by filament lamps (normal yellow type bulbs you find). This produces an excess of red and yellow light, which creates a warm flattering effect. Almost all colors can be used with this lighting, except that brown and purples may appear darker than what they are. Choose a lighter foundation than normal to reflect the light, and use frosted highlighting products where possible for the same reason. PINK LIGHT – Found in certain restaurants with a definite color vision. May make makeup look warmer. So, the deeper pink shades of blusher may look red. This type of lighting will make green colors look dull, sparkle or tints are the most flattering and romantic is this type of lighting. ROSE LIGHT – Contains softer tone of red and pink light, flattering to all skin tones and will enhance any makeup. BLUE LIGHT – Definite tone of blue in a white basic light. Turns any makeup gray. It’s very hard on makeup and makes blusher or shaders look way deeper than what they are. Lighter colors should be used. A bride is probably one of the most stressed women on earth when it’s her wedding day, and as a makeup artist, we have to keep her confident in knowing what we are doing to make her look great on her important day. It’s advisable to do a practice run on a bride to be. Don’t ever do first time makeup on the wedding day! Remember that many brides in different cultures don’t marry in white, so be prepared for the more exotic kind of makeup application. A brides age also plays a role. She can be 16 and go all the ways to 90 years young. Shocking but true. Most importantly, it’s not how YOU want it, its how SHE wants it. However, ask your bride to give you ideas, and if her ideas look crap and you know it, apply makeup as she wants it. Take a photo and then do it your way. That way she can compare shots and see that blue eyes, pink lips and purple cheeks ain’t wedding pic friendly. A) Date and time of the wedding. B) Detail of the wedding dress and flowers. C) Hair styles and headdress. D) The clients experience with makeup. Take type of photography into consideration. Make use of blusher, because brides appear washed out, due to nerves. Foundation should match skin tone perfectly. Create dark demarcated lines on the eyes and lip areas. 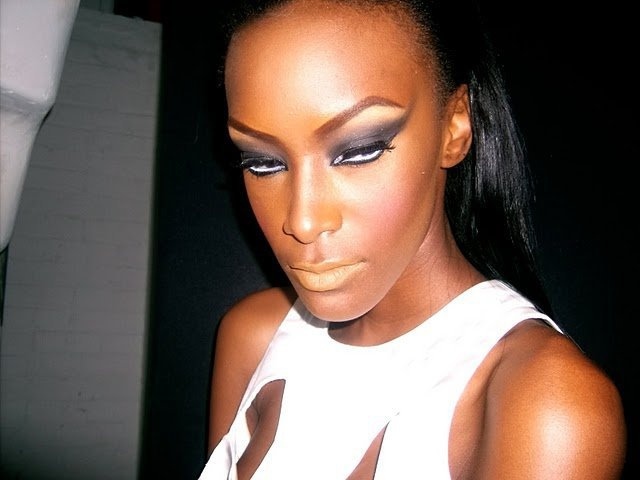 Use black as eyeliner, dark brown is a better option. Use foundation with a high SPF. This reflects with the flash of the camera which may give your bride a mask look on the photos. I will be posting on another post elaborating on bridal makeup. Don’t miss out!